• An extra patient leaflet is available with Amoxicillin . Talk to your pharmacist if you have questions about this information. • Take Amoxicillin by mouth with or without food. If stomach upset occurs, take with food to reduce stomach irritation. • Do NOT chew or swallow Amoxicillin whole. • Place Amoxicillin in a small amount of water (about 2 teaspoons/10 mL). Do NOT use any other liquid. Swirl or stir until the tablet is completely mixed in the water. Drink right after mixing. Be sure to drink the entire mixture. Rinse the container with an additional small amount of water and drink to be sure all the medicine is taken. • To clear up your infection completely, take Amoxicillin for the full course of treatment. Keep taking it even if you feel better in a few days. • If you miss a dose of Amoxicillin , take it as soon as possible. If it is almost time for your next dose, skip the missed dose and go back to your regular dosing schedule. Do not take 2 doses at once. • Amoxicillin may cause dizziness. This effect may be worse if you take it with alcohol or certain medicines. Use Amoxicillin with caution. Do not drive or perform other possibly unsafe tasks until you know how you react to it. • Amoxicillin only works against bacteria; it does not treat viral infections (eg, the common cold). • Be sure to use Amoxicillin for the full course of treatment. If you do not, the medicine may not clear up your infection completely. The bacteria could also become less sensitive to this or other medicines. This could make the infection harder to treat in the future. 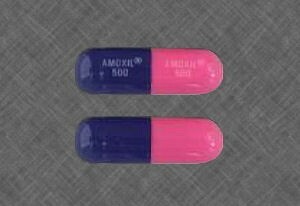 • Long-term or repeated use of Amoxicillin may cause a second infection. Tell your doctor if signs of a second infection occur. Your medicine may need to be changed to treat this. • Contact your doctor right away if stomach pain or cramps, severe diarrhea, or bloody stools occur. Do not treat diarrhea without first checking with your doctor. • Hormonal birth control (eg, birth control pills) may not work as well while you are using Amoxicillin . To prevent pregnancy, use an extra form of birth control (eg, condoms). • Some of these products contain phenylalanine. If you must have a diet that is low in phenylalanine, ask your pharmacist if it is in your product. • Brown, yellow, or gray tooth discoloration has occurred rarely in some patients taking Amoxicillin . It occurred most often in children. The discoloration was reduced or removed by brushing or dental cleaning in most cases. Contact your doctor if you experience this effect. • Diabetes patients - Amoxicillin may cause the results of some tests for urine glucose to be wrong. Ask your doctor before you change your diet or the dose of your diabetes medicine. • Lab tests, including liver function, kidney function, and complete blood cell counts, may be performed if you use Amoxicillin for a long period of time. These tests may be used to monitor your condition or check for side effects. Be sure to keep all doctor and lab appointments. • Use Amoxicillin with caution in the ELDERLY; they may be more sensitive to its effects, especially patients with kidney problems. • Use Amoxicillin with extreme caution in CHILDREN younger than 10 years old who have diarrhea or an infection of the stomach or bowel. • Caution is advised when using Amoxicillin in CHILDREN younger than 3 months old; they may be more sensitive to its effects. • PREGNANCY and BREAST-FEEDING: If you become pregnant, contact your doctor. You will need to discuss the benefits and risks of using Amoxicillin while you are pregnant. Amoxicillin is found in breast milk. If you are or will be breast-feeding while you use Amoxicillin , check with your doctor. Discuss any possible risks to your baby. • evere allergic reactions (rash; hives; itching; difficulty breathing; tightness in the chest; swelling of the mouth, face, lips, or tongue); bloody stools; confusion; dark urine; fever, chills, or persistent sore throat; red, swollen, blistered, or peeling skin; seizures; severe diarrhea; stomach pain or cramps; unusual bruising or bleeding; vaginal discharge or irritation; yellowing of the skin or eyes.